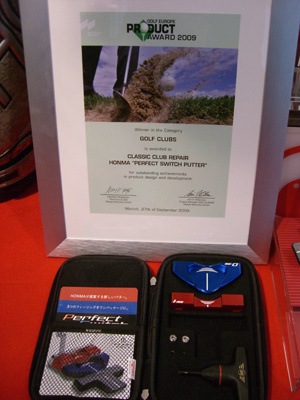 『Perfect Switch Putter has been awarded in GOLF EUROPE Product Award 2009 as "Winner in the category GOLF CLUBS". 2nd placed R9 Iron by Taylormade, and 3rd placed Ora by GEL Putter. Please refer below comment in GOLF EUROPE official site. The selection was made by examining the functional aspect, design, degree of innovation, and ease of use.